It’s a new year. And we all feel renewed and full of projects. Promises. “This time” I will do it. I will make a list but I WILL do what’s on it. Familiar? But, really? We are all guilty of this one. Aiming real high and expecting that the change of a number in the calendar is going to make us change, from one day to the other, our discipline or our working patterns. We all have done this. In the last few years, out of pure necessity, I have learnt to let go of lists set in stone. I still make them mentally, but just to get some order. The reality is that we can plan, and make lists and promises… but in truth, it only works if you just take the first step. Stop dreaming, start making. Just start. In an attempt to make it a family motto, I made over the Christmas break a little illustration. 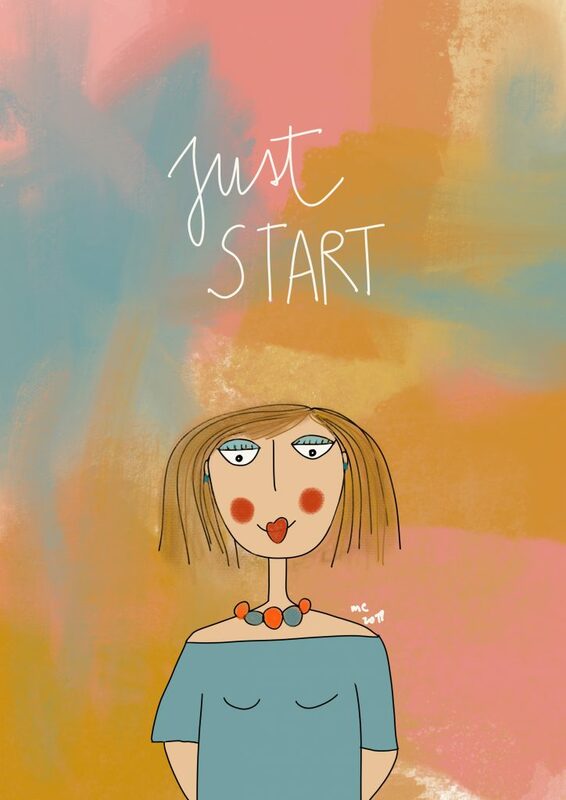 Very whimsical and colorful… and it says simply “JUST START”. I will have prints for sale on my etsy shop soon. Do you need one? You can always contact me via e-mail.